Less awareness of reality is ignorance & less potential conflict with others, since we have less knowledge that can create a conflict. Blank-page “unity” is easy, it’s a “unity” through being lesser aware, blank and empty of truth vs. falsity, right vs. wrong. One blank book is the same as another blank book. Only knowledge differentials create division. When everything is blindly accepted as valid to avoid conflict, false “unity” occurs. Truth divides from falsity. Truth rejected or falsity accepted between people, creates disunity. More awareness of reality is knowledge, either positive accurate truth or negative inaccurate falsity, and therefore more points of possible conflict. Shared quality accurate knowledge, i.e. truth, is the Path and Way to True Unity. Learning the truth in reality, including how our consciousness functions, psychology, etc. is much more difficult. It requires time, energy, effort, dedication, persistence and determination. Truth takes time and effort. Inaccurate knowledge, i.e. falsity, can’t create true unity, but can create false “unity” on the commonality of mutually accepting falsity. Falsity needs to be removed for a real, authentic, truly whole, solid and integrated unity to occur. The real and authentic strength, solidity, integrity, quality & groundedness of unity within ourselves psychologically (thoughts, emotions, actions) and of our perceptions with reality, is based on the quality knowledge of truth & morality we take in and discern. The more ignorant of truth & morality we are, the more holes we have in our foundational comprehension, and the weaker and falser our attempts at “unity” are. This leads to being a falser self, compared to a truer self that is united, integrated and strengthened by the truth of reality. The ignorant masses are living the same relative program of a falser self. We are either being ignorant of important true aspects of reality that matter to positively evolve ourselves and the condition of the world, or we are in acceptance of false negative knowledge of various kinds (falsity accepted as “truth”). Being ignorant makes us more easily united since we have nothing to be divided by, but this is not real True Unity. Accurate knowledge of reality brings Truth. More quality knowledge separates us from the collective ignorance or conformity and attachment to falsity. Ignorance is conformity to a programmed conditioned way of living in the system. Knowledge allows divergence from the false conformity, filling up your empty pages with accurate truth makes it harder to unite with others who do not and reject the truth, or are attached to falsity. We struggle with various information, misinfo and disinfo to try to find the truth, getting caught in traps, cul-de-sacs & mind “viruses” along the way, getting attached to “feel-good” self-views & wolrdviews constructing beliefs accepted as “truth”. Negative knowledge makes True Unity impossible. 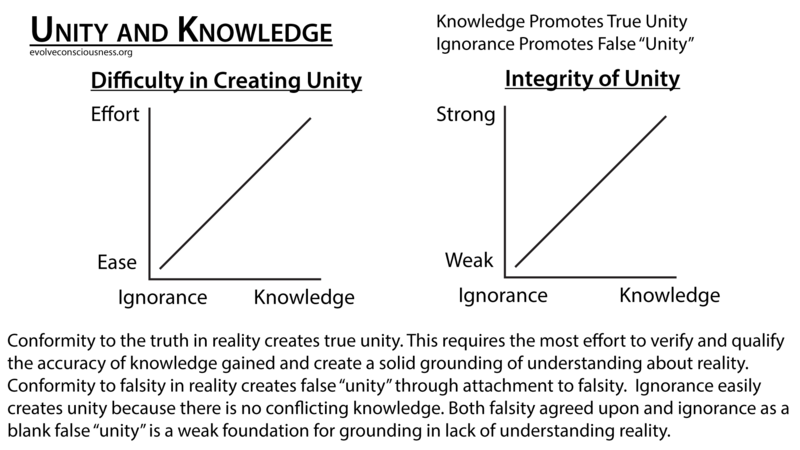 The more info that exists (including disinfo), the more potential falsity is spread, the more difficult it is to gain quality knowledge in the confusion of massive amounts of information to discern, and the more difficult it is to unite on that solid grounded foundation of accurate knowledge (truth), instead of the faulty, flimsy, false “unity” from incorrect or useless knowledge. Truth inherently divides from falsity. The only way to truly unite is for everything to care for, seek, embrace, accept, integrate and live the truth.